In less than a year, the NEW brand on the block ARKET has established itself as the go-to brands for timeless, simple and beautifully made fashion staples and their collection keeps getting better. However, finding things in ARKET is defo not an issue! Oh no!! 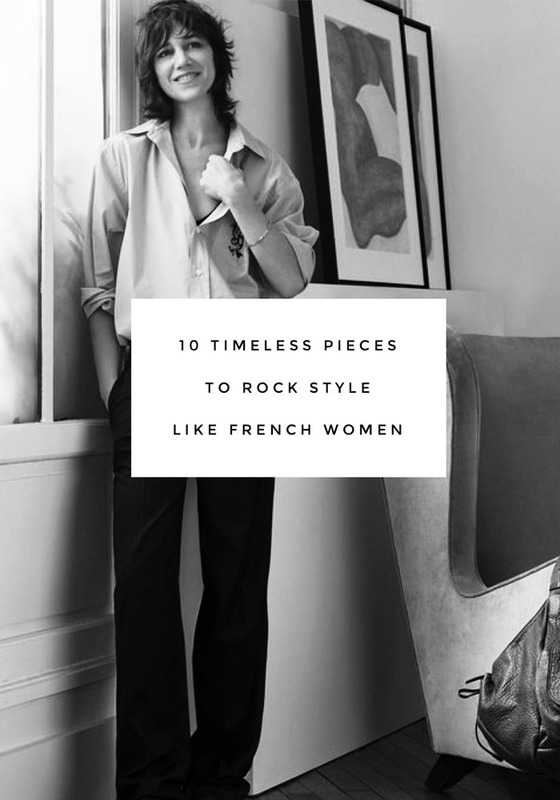 In fact, as the ARKET SALE IS ON, I’ve selected 10 staple pieces that grace the wardrobes of us French women because I think you will love them. When I saw this beautiful black shirt, I immediately thought of Emmanuelle Alt (Editor of the French VOGUE). I’m sure you’ve seen a few pictures of Emmanuelle Alt on Pinterest. If you haven’t, you can follow the new Pinterest board I dedicated to her style here. A great, flattering cut on small waists, this poplin skirt is undeniably stylish and I love how it can be paired with a simple, white t-shirt or these super cool SUPERSTAR t-shirt & ROCK’N ROLL t-shirt from Hush. A classic piece, this wool shirt jacket will mean business and can be worn over a t-shirt or on bare skin. Great for casual Friday or to wear during the weekend, you can pair this Breton jumper with your favourite pair of denim (mine are currently these high waist ankle jeans from H&M) and a pair of Bensimon (currently 25% OFF on LA REDOUTE). I simply love the cut of this Wool linen blazer because it’s beautiful, the fabri feels high-quality and it reminds me of a photo of Peter Lindbergh (the one with top models wearing white shirts and large tailored trousers). As some of you know, I’m a massive fan of jumpsuits. It’s a versatile piece of the clothing, easy to wear on various occasions and on top of it, this black jumpsuit has a very flattering cut. During my trip to Madrid last week, my fellow Bloggers and I debated what khaki was. Is it a beige or green? I’ve always assumed was green but I’m coming around the beige version. What’s your take on this? With its water-repellent fabric & hood, this Parka is perfect for Autumn and many seasons to come. One of my pleasures in life is wearing a cashmere jumper on bare skin and I love the colour and softness of this one. I grabbed myself a pair of Selvedge jeans while in Paris and I strongly encourage you to do the same because they look great. Last but not least, this 3/4 wool coat is one of my favourites because it’s a timeless piece that will keep you warm in Winter times and will always look super stylish. Je vais devoir aller magaziner en France (on dit pas shopping au Québec haha) parce qu’ils ne livrent pas chez nous. J’adore le parka et le manteau 3/4. Pour moi kaki c’est vert armée ou proche et un parka, c’est l’équivalent hivernal. Je pensais comme toi jusqu’à ce qu’on m’explique la semaine dernière que khaki en tant que nom de couleur avait été introduit par l’armée anglaise en 1848 pour nommer la couleur de leur uniforme qui étatit un marron clair.